Publisher Fun Studios International, the folks that brought out the young adult hardcover Star Wars: Forces Of Destiny - Tales Of Hope & Courage. 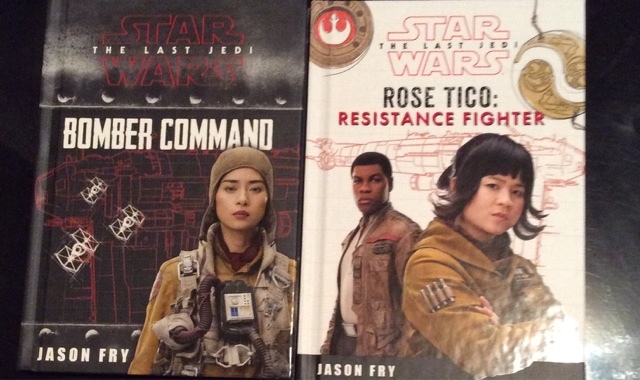 Have released two beautiful hardcover companion young adult books, which are also suitable for fans of all ages entitled Star Wars: The Last Jedi - Bomber Command while the companion book is entitled Star Wars: The Last Jedi - Rose Tico: Resistance Fighter. Both are written by Jason Fry. Bomber Command is a journal of Paige Tico, Pilot and Technician for Cobalt Squadron. The book covers Paige’s journey going back to her youth with her sister Rose to her role as a bomber at the Battle of D’qar. The book is beautifully illustrated with detailed sketches that look as though they were literally created by the character herself and eight large gatefolds containing bomber schematics, a look at the Y-Wing Starfighter, Confederacy Hyena BomberImperial Tie Bomber as well as the Resistance Bomber type seen in the films. There also some cool manual covers written in the Star Wars galactic language with short English translations that help this journal to appear more authentic as something that really existed along time ago in a galaxy far, far away. Also included is a galactic map fold out of what is now considered First Order Space and even a recruitment brochure excerpt. The text appears as though it was all handwritten and translated into English. Rose Tico: Resistance Fighter follow Rose’s feelings of living in her Sister’s shadow, while still committing herself as a dedicated member of the Resistance. Detailing the ways in which finds life-saving solutions to protect those she serves leading up her collaboration with Finn, which solidifies her vision and hope for the future. Both books are very similar though Rose’s seems more personalized kind of like a diary and her penmanship seems neater than her older Sister’s. sketched and diagrams reminiscent of the other book are also featured here. Both Star Wars: The Last Jedi - Bomber Command and Star Wars: The Last Jedi - Rose Tico: Resistance Fighter are available now at retailers on and offline for the suggested retail price of $11.99 in the U.S. and $1599 in Canada courtesy of Publisher Fun Studios International. Buy them both. They make a great set and May The Force Be With You Always.